Mix 1/3 cup sugar and lime gelatin mix in medium bowl. Add 1 cup boiling water; stir 2 min. until completely dissolved. Add enough ice to 1/2 cup cold water to measure 3/4 cup. Add to lime gelatin; stir until ice is completely melted. Refrigerate 30 min. Meanwhile, repeat Step 1 using watermelon gelatin mix and omitting the refrigeration step. Pour 2 Tbsp of the watermelon gelatin into each of the 16 (3-oz) paper cups. Freeze 20 min (no more, no less!). Stir 1/2 tsp mini chocolate chips into gelatin in each cup so that they are somewhat evenly spaced. Spoon an additional 2 tbsp yogurt into the cups on top of the red gelatin mixture. Freeze for another 10 minutes. Then gently pour 2 tbsp. of the lime gelatin mixture on top of the yogurt layer in each cup. Insert a stick into each cup, then freeze for 3 hours or until frozen. Tired of the summer heat wave? Chill out with the perfect frozen treat! ‘Tis the season for watermelon. And freezer pops. 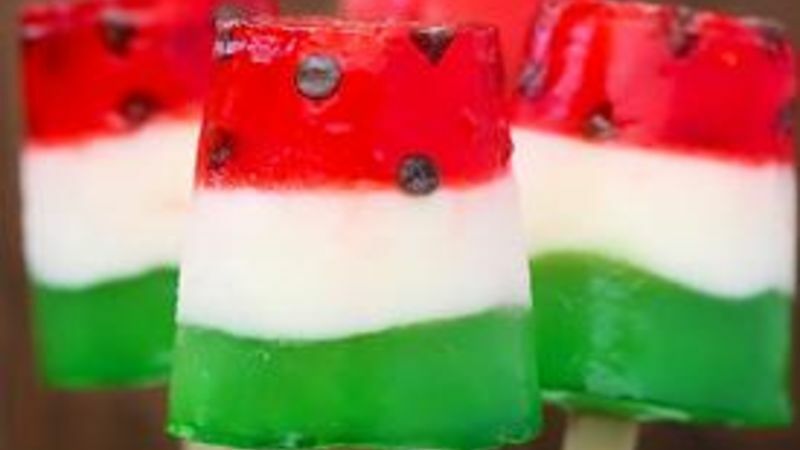 So of course, it only makes sense that you should make these Watermelon Freezer Pops! These definitely kick the idea of freezer pops to an entirely new level. Made from simple gelatin and yogurt, these cute little pops begin with a layer of lime gelatin, topped with French vanilla yogurt, and then topped with the bright red watermelon layer and some sweet little surprises for “seeds." Definitely a fun dessert that kids and adults will love, and there is no ice cream maker required! Just a simple, adorable and festive popsicle recipe to celebrate a favorite fruit of the season. Cheers to the amazing watermelon! Once you’re ready to serve, pull out a cup and run the sides of it under warm water for a few seconds, and then the popsicle should “pop” (ha!) right out! Enjoy the watermelon deliciousness!